The medical procedure known as beard hair transplant has been on the rise in the last few years. When patients think about having a hair transplant, they usually think of the traditional method of transplanting hair to the scalp. However, many patients find it difficult to grow a beard or their beard has uneven growth with patchy areas. These patients can easily restore their beard by undergoing a beard transplant. Beard hair transplant could be done with any kind of donor hair but the most popular is scalp to beard and beard to beard hair transplant. 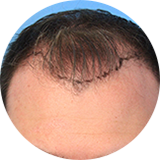 Scalp to beard hair transplant: The advantage of using scalp hair to restore the beard is that it is the most abundant source of hair in non-balding men. Transplanted scalp hair could be slightly different from natural beard hair, but the surgeon can blend it so it looks natural. Beard to beard hair transplant: Beard to beard hair transplant could be performed on people who have plenty of hair on the bottom of the chin and the neck area. Most people who grow a beard trim or shave their neck hair and we can use this unwanted hair to restore their beard. The advantage of using beard to beard hair restoration is that the characteristics of the hair shafts are exactly the same between the donor and recipient area. Schedule a consultation appointment with Dr. Mohebi. The consultation appointment is the time for patients to learn more about scalp to beard hair transplant and to ask any questions on their mind. Dr. Mohebi will discuss their past medical history, as well as any current medications they are taking, to make sure the patient is an ideal candidate for beard hair transplant. It is also the time for patients to discuss their desired results with the doctor. Stop smoking or drinking alcohol at least two days before the scalp to beard hair transplant procedure. Smoking can have a negative impact on the healing process and delay the recovery process. Patients might also be asked to stop taking certain medications such as blood thinners or Aspirin before the procedure. We also recommend shaving the beard at least 2 days before the hair transplant and no shaving after that for the procedures where we use beard to beard hair transplant. This is so the beard hair will only show a growth of hair that is in the growth phase (Anagen) so the surgeon can extract the proper grafts. On the day of the procedure, patients should dress comfortably and also have a family member or friend ready to drive them home after the beard hair transplant is performed. Before the actual beard hair transplant begins, the donor hair should be harvested from the sides or back of the scalp and/or from the lower part of the beard area. The hair grafts are extracted using Follicular Unit Extraction (FUE) to individually remove hair grafts from the designated donor area. By moving the hair grafts individually, there is no linear scar left in the donor area. The new design for the beard is marked by the doctor before the procedure begins. Once the doctor has the new hair design for the beard, the local anesthesia will be administered. Then the sites will be made. Those are the microscopic incisions that will receive the follicular grafts. As the process of extracting the hair grafts begins; harvested hairs would be implanted into their final homes. The hair grafts are strategically placed in the beard area in order to create the desired density and appearance of facial hair. The hair grafts are implanted in the beard using the FUE simultaneous extraction and placement method which means the hair grafts are implanted immediately while being extracted from the donor area. This method minimizes the amount of time the grafts are “out of body” and also improves the overall quality of the beard hair transplant grafts. The donor area will heal very quickly after the procedure. The patient may have some redness on the recipient area for about a week. Scabbing and mild irritation is not uncommon during the first few days. Patients will be asked to return to our office the next day where we will wash the transplanted and donor areas and show them how to properly care for the transplanted hair. 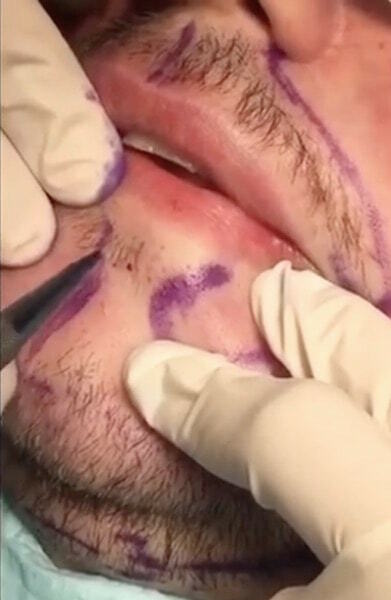 We will also review all the post-op instructions to make sure patients have a comfortable recovery process after their beard hair transplant. The next appointment is at two weeks post-op when we expect the healing to almost be completed and little to no inflammation on the recipient area. Patients usually lose the hair shafts of the transplanted hair within the first 3-4 weeks. The new hair starts growing around 2-3 months from the procedure. After this point, the hair become longer and thicker to the point that we expect to see the full results after 6-8 months. Patients usually lose the transplanted hair shafts after the first 4 weeks from the procedure. We recommend not shaving the transplanted beard hair for four weeks until the shafts are fallen. Patients should avoid direct sun exposure to the recipient area for at least 6 months from the time of their procedure to minimize hair damage, hyperpigmentation and hypopigmentation. Want to learn more about the natural looking results that can be achieved by a beard hair transplant? Contact out office today to schedule your consultation appointment.